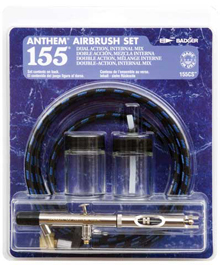 An airbrush is a small, air-operated tool that sprays various media including ink and dye, but most often paint by a process of nebulization. Spray guns were developed from the airbrush and are still considered a type of airbrush. 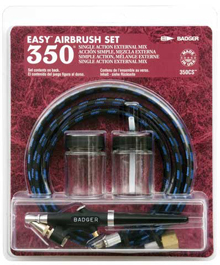 This set features a dual-action, internal-mix, siphon-feed (bottom-fee) airbrush that provides flawless performance even in rigorous production airbrushing environments. It features a two-angle needle tip that precisely fits the cone-shaped nozzle enabling a single needle/nozzle configuration for spraying mediums, inks, dyes, watercolors, acrylics, enamels, lacquers, glazes and more, thus eliminating the need for fine, medium or large needle/nozzle variations. Its body design provides exacting balance and long-term user comfort. It can spray pencil thin lines up to a 3"(76mm) spray pattern. Ideal for multiple applications for novice to advanced airbrushers. Easy to clean and maintain. The set also includes two empty bottles and an air hose. 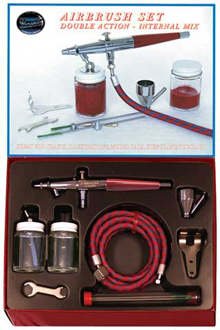 Includes a VL#3 Double-Action Airbrush, size 1 & 5 spray heads, a head protecting cap, a metal color cup, two bottle assemblies, one bottle and cover assembly, a hanger, a wrench, one 6' Air Hose, the "22 Airbrush Lessons" booklet and assorted other parts. 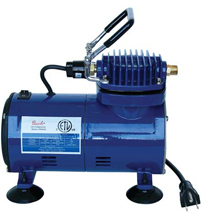 The D500 is an economical compressor suitable for all airbrushes spraying properly thinned fluids. It is capable of delivering up to 35 lbs. of pressure, is an oil-less diaphragm unit and comes with a grounded three-wire cord. The D500 operates on 115 volts, one phase, sixty cycle, 1/10 HP, three AMPS and delivers .4 CFM at 20 p.s.i. The D500 Compressor is CSA Approved and UL listed. An airbrush works by passing a stream of fast moving (compressed) air through a venturi, which creates a local reduction in air pressure (suction) that allows paint to be pulled from an interconnected reservoir at normal atmospheric pressure. The high velocity of the air atomizes the paint into very tiny droplets as it blows past a very fine paint-metering component. The paint is carried onto paper or other surface. The operator controls the amount of paint using a variable trigger which opens more or less a very fine tapered needle that is the control element of the paint-metering component. An extremely fine degree of atomization is what allows an artist to create such smooth blending effects using the airbrush. The technique allows for the blending of two or more colors in a seamless way, with one color slowly becoming another color. Freehand airbrushed images, without the aid of stencils or friskets, have a floating quality, with softly defined edges between colors, and between foreground and background colors. A well skilled airbrush artist can produce paintings of photographic realism or can simulate almost any painting medium. Painting at this skill level involves supplementary tools, such as masks and friskets, and very careful planning. 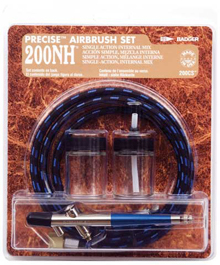 Some airbrushes use pressures as low as 20 psi (1.38 bar) while others use pressures in the region of 30-35 psi (2-2.4 bar). Larger "spray guns" as used for automobile spray-painting need 100 psi (6.8 bar) or more to adequately atomize a thicker paint using less solvent. They are capable of delivering a heavier coating more rapidly over a wide area. Even with small artist airbrushes using acrylic paint, artists must be careful not to breathe in the atomized paint, which floats in the air for minutes and can go deep into the lungs. With commercial spray guns for automobiles, it is vital that the painter have a clean air source to breathe, because automotive paint is far more harmful to the lungs than acrylic. Certain spray guns, called High-Volume Low-Pressure (HVLP) spray guns, are designed to deliver the same high volumes of paint without requiring such high pressures.